Born close to the village of Kilkea, between Castledermot and Athy, in the south of County Kildare in 1874, Ernest Shackleton is renowned for his courage, his commitment to the welfare of his comrades, and his immense contribution to exploration and geographical discovery. 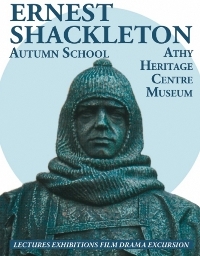 The Shackleton family first came to south Kildare in the early years of the eighteenth century. Ernest’s Quaker forefather, Abraham Shackleton, established a multi-denominational school in the village of Ballitore. This school was to educate such notable figures as Napper Tandy, Edmund Burke, Cardinal Paul Cullen and Shackleton’s great aunt, the Quaker writer, Mary Leadbeater. Having gone to sea as a teenager, Shackleton joined Captain Scott’s Discovery expedition (1901 – 1904) and, in time, was to lead three of his own expeditions to the Antarctic. His Endurance expedition (1914 – 1916) has become known as one of the great epics of human survival. He died in 1922, at South Georgia, on his fourth expedition to the Antarctic, and – on his wife’s instructions – was buried there.